I think it's best to preface this blog post by saying that I’m definitely a person who enjoys notebooks, stationery and all the pens, markers and post it notes possible. I always justify it to myself that the pretty little notebook on the shelf at Target is going to make me get #allthethings done and be so much more productive just because I own new pens and a notebook. And once again I would bring a notebook home and it would sit on a shelf next to all the other notebooks that we’re supposed to make me productive. Let's not talk about all the planners that I wrote in for a month and then got tired of carrying it around. So I went on a notebook and stationery ban, got rid of all that stuff and then resorted to this awesome notebook/binder combination thing that kind of worked. It worked until I realized I had papers everywhere throughout the planner, I would write something down on one sheet and then write three other ideas down on another sheet and then misplace them in this binder. All this time I’ve been trying to find a system that works when i had the perfect tool sitting on my desk that I was using for a completely different reason! That great nifty little tool was my iPad Pro! I was using my iPad Pro for all these other design specific reasons but I never thought about using it for digitally planning. 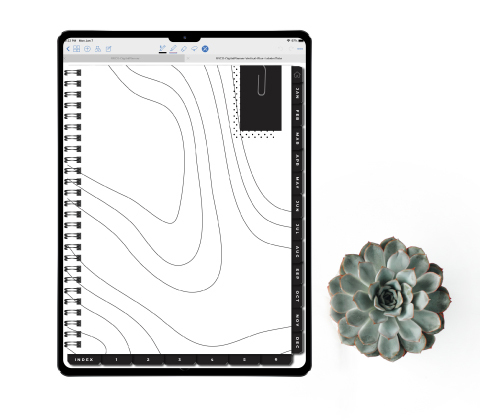 Sure, I had the GoodNotes app that I purchased when I first got the iPad and I dabbled in creating own GoodNotes covers but the game changer came when I discovered digital planning in GoodNotes where you actually design and use a planner digitally. I could arrange my notebook exactly to how I want it and include all the tabs I need and GoodNotes let you link to those tabs for super quick access. So wait, I can have a completely custom notebook, create templates for specific pages so my notes don’t get lost, I can have a calendar and really cute stickers to plan, and even include journal pages, all while reducing my environmental footprint?! I’m freaking sold. I will be completely transparent, I wasn't huge on taking digital notes but when you have the iPad pencil and you’re writing in a planner that operates like a real planner, it makes it so enjoyable. I am no longer the person that would have a paper planner, transfer all due dates to Asana for reminders and then throw away the paper I just wrote on. Now I can have everything live on my iPad and I’m finding I don’t even have to place things in Asana as often because it’s all in my planner. (The things I place in Asana are things that I need my team or clients to see but other than that I keep everything in my digital planner on my iPad. Now, you might be wondering... where do you buy a digital planner? I have digital planners in my shop! 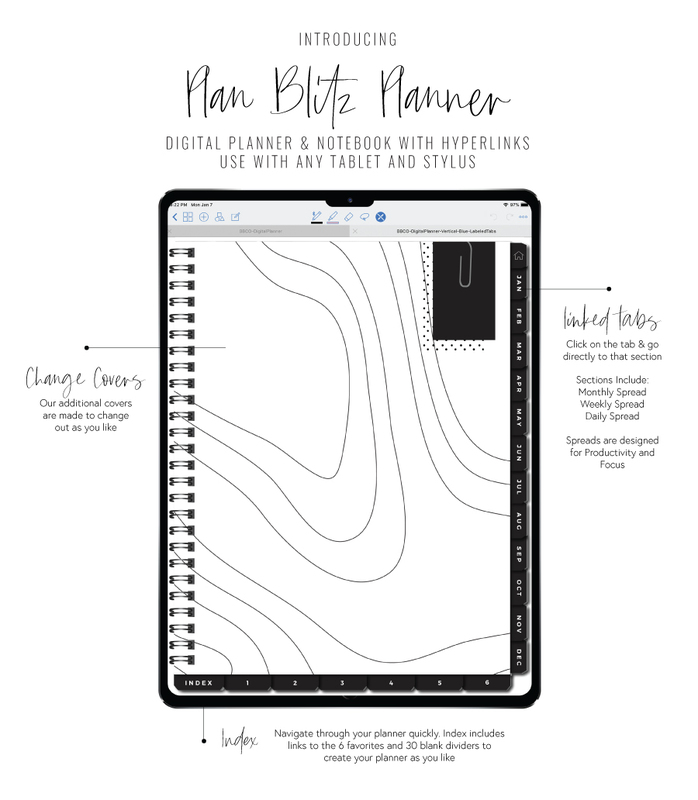 We created our signature digital planner called the Plan Blitz Planner. When I started this obsession of digital planning I tried out so many different options to get the planners to the way i wanted it. Keeping it transparent again, I would stop using paper planners because I got tired of the way they looked, or I didn't like how they setup their pages, or I thought they were missing something. I couldn't do all the things I wanted to do in one planner. I would basically carry a paper planner and a notebook around all the time. 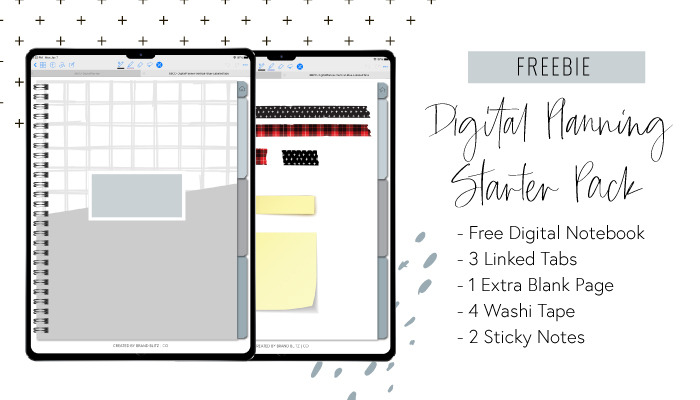 So when I found a system that worked for me and I decided that I wanted to sell the digital planners, I knew I wanted to create a planner that lets you customize the planner your way! The only thing that doesn't change in the Plan Blitz core planner are the colors of the tabs.is available in colors. Unfortunately, the way that GoodNotes and Notability works, you won't be able to change the colors of the tabs later on so make sure you choose your core planner based on the appropriate colors. (I'm using the white one because I know I’m going to be changing the covers frequently.) After you get your core planner which comes with monthly, weekly, and daily planners, and a daily journal planner, you can customize and add to the planner as you need. The core planners also come with lined, blank and dot grid papers so you can add them throughout the planner when you need them.The dot grid allows you to make the planner into a bullet journal if you' want. We offer page bundles in the shop that you can place into your planner and all links are still functional. Also, want to change covers for each season? Or do you want there to be a different cover on each divider? Buy a cover bundle pack and customize. The other fun part is that you can add in "stickers" so if you're a paper planner that loves adding in stickers to your monthly and weekly spreads, these will definitely be a game changer for you. Besides being able to customize everything, we made these planners undated so that you can use them year after year. Woo! New year? Just import the original file download and you'll have a fresh planner. We are literally obsessed. My plan was just to create a digital planner for myself to use for my business but there is no way that I could keep this resource to myself. If I can make something that makes an impact on your business as much as these have made an impact on mine, then I knew I had to share.